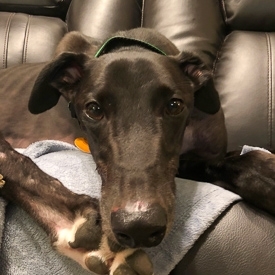 8/28/2018: Blackie is a sweet boy who loves to laze around! He is a little shy at first, but once he warms up he will latch on and follow you wherever you go! While he has not had the opportunity to interact with cats yet, he does get along well with children and dogs of all sizes. He tolerates harassment from his small-dog foster brother like a champ! 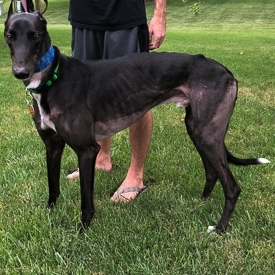 After retiring, Blackie lived happily with the family of his racing owner for over a year until a change in housing made them unable to keep him. He is currently kept in a crate when he is home alone, but he is not a fan of this concept. Even in the crate, he struggles to hold his bladder for a full 8-hour workday. We’re still working on a feeding/bathroom routine to minimize this issue. Although he has excellent house manners, he was accustomed to being on the furniture with his previous family. That habit could probably be broken with a little training, but how could you say no to that face? Blackie will be the perfect addition to the right family and provide unconditional love for years to come!